Find the missing piece for your renovated bedroom with our Amish Americana Platform Bed. 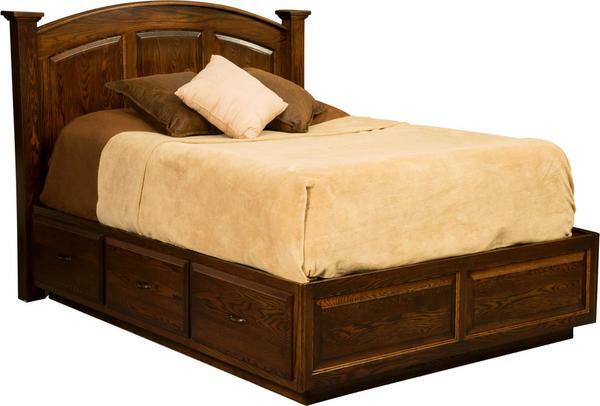 This solid wood bed is available in a full, queen or king size for your convenience. Select a size that best fits in your suite! Enjoy three drawers on each side for storage. Keep your extra clothes, bedding, pillows or other items in the spacious drawers. Choose one of our premium hardwoods and the stain color of your choice for this handmade Amish bed to be crafted in. If you need any assistance with placing your order or if you have any questions, please give one of our Amish Furniture Specialsits a call today at 866-272-6773.